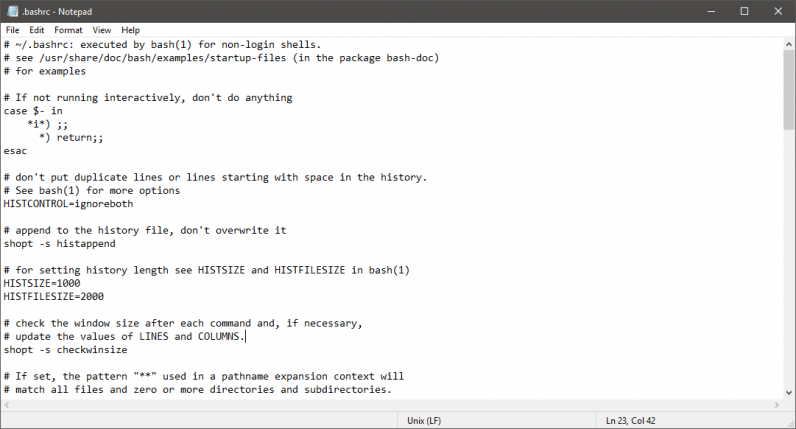 Microsoft has updated Notepad, its legendary text editor, with something that’s been on the wishlist of most Windows-using coders — the ability to view and edit text files created on UNIX-based systems, like macOS and Linux. This meant that if you opened a text file created on a Unix system, it’d look… well… a little screwy. Below is a .bashrc file opened in Notepad. Notice how it’s all squished together. Yikes. You can read about it here on Microsoft’s blog. This is great news, especially given that Windows 10 is increasingly favored by developers. Where once you’d go to a developer conference and be confronted by a sea of MacBook Pros, you now often encounter islands of Surface Books and Dell XPS laptops. That’s because Microsoft has done a lot of work in courting the developer demographic, with efforts like the Linux Subsystem for Windows, and porting BASH. Obviously, hardly anyone does any serious development in Notepad. It lacks the most basic features, like syntax highlighting, plugins, and more. That said, given that it’s often used for quick-and-dirty edit jobs, it’s nice that Microsoft fixed this common bugbear with one of its oldest existing products.